The CM-600d handheld spectrophotometer is an easy-to-use color measuring instrument with a fixed aperture setting (MAV: F8 mm/F11 mm). Using a range of user-friendly functions, the CM-600d spectrophotometer effectively measures the color of an object. 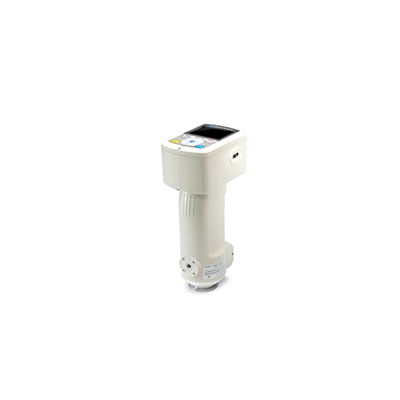 Ergonomically designed to fit your hand comfortably, this handheld instrument also features a color LCD screen. spectral graphs, pseudocolor, and color difference graphs are some of the abundant information displayed on the screen. Users can also reproduce measured colors as color patches on the screen, useful for searching for colors and checking the level of color difference. 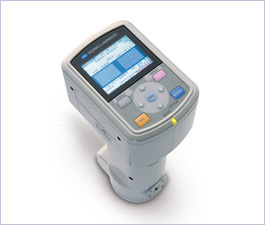 The dedicated buttons for frequently-used operations such as call up menus or target colors enhances the CM-600d Spectrophotometer’s ease of use. Anyone can operate the unit intuitively with the menu-driven display. Information can be communicated wirelessly to a PC or printer thanks to Bluetooth compatibility, and the unit contains a large memory capacity, which has the ability to store 1,000 sets of target data and 4,000 sets of measurement data. To top it off, the unit is completely portable. The CM-600d Spectrophotometer displays multiple views of data results which can be edited due to SpectraMagic NX software compatibility. Associating two or more secondary targets to target data of the primary target allows for sophisticated QC applications, such as checking for color difference. The included software features drag-and-drop functionality, so information can be easily interpreted after printing. Display information with a variety of graphs, or utilize any of the preconfigured templates available. In addition, instrument information is available at a glance in the available status window. Do you have data compiled with older software? No problem. Simply transfer it into the newest updated software since it’s compatible. Information can also be easily exported into Excel if that’s what’s needed to show data. For additional information, Color Tutorial is included, as is a Navigation Function.